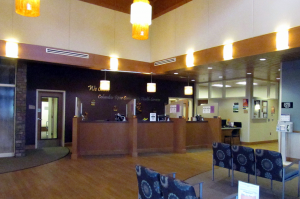 Lobby of the primary care center at CRH Boardman via crhclinic.net. PENDLETON, Oregon – Columbia River Community Health Services is exploring the possibility of opening a facility in Pendleton, and the Umatilla County Board of Commissioners has agreed to help. The Boardman-based clinic already operates the school-based health centers in the Pendleton district. Board Chairman George Murdock says CRH is applying for $1.5 million community development block grant from Business Oregon to take over the vacant office building at the old site of St. Anthony Hospital. “They’re seeking to develop a clinic in Pendleton that would serve clients who, for the most part, don’t have really good health options right now,” Murdock said. To qualify for the grant, Umatilla County had to agree to administer the funds. The decision by the board was unanimous. “We’re excited about the possibility of expanding healthcare options, and we’re certainly excited about the possibility of helping find a good use for a vacant office building,” Murdock said. Columbia River Health’s website states that the facility focuses on caring for under-served and vulnerable people in their community by providing access to primary and preventative healthcare. In Boardman, its services include physical and behavioral health, dental, pharmacy, and occupational health. Its support services include transportation, translation, Oregon Health Plan or other insurance enrollment, voter registration, and connecting people to community resources.